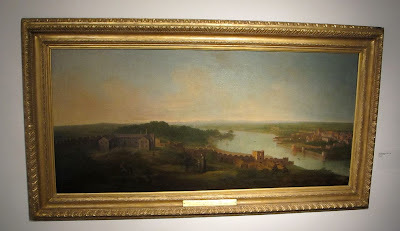 'Welcome to Drogheda' is a result of one of the invigilators at the Highlanes Gallery pointing out Ricciardelli's two paintings of the town from 1754/5 and explaining that the Italian artist had possibly embellished the scenes with the feel and the golden palette of his homeland. Certainly Drogheda looks incredibly beautiful in the paintings and on first glance could be easily mistaken for Verona or Florence. Ricciardelli's great skill in portraying Drogheda in the best light possible inspired me to do the same and search for everything that is great and good about the town. I've visited several times over the past few months collecting stories about Drogheda which will inform my residency in the gallery which begins on August 14. Incidentally I looked up the Christies website and a painting of Naples by Ricciardelli recently sold for £95,000.